What is it about the stripped-down, non-“acting” style of Robert Bresson’s films that somehow bares the essential humanity of the characters? In Pickpocket, why did I feel suspense, pity and genuine fascination, when the actors hardly ever indicated any significant change in facial expression? Less can be more, but most films would fall flat on their face if the actors involved did as little as Bresson requires. It is his shot selection and pacing that are key in conveying what he wishes to convey. In Pickpocket, I immediately put myself in Michel’s shoes. There is a difference between relating to a character and feeling like he is truly your stand-in. Oddly enough, I associate this same type of feeling to many action video games. The character on the screen does all of the moving, traveling and interaction, but any feelings and interpretations are solely in the possession of the player holding the game controls. Make no mistake, Pickpocket is miles above any video game, but Bresson nevertheless leaves his main character as a relatively blank slate. We know that stealing excites Michel. But whatever it is that drives him, what goes on behind his eyes, is left for the viewer to project onto him. 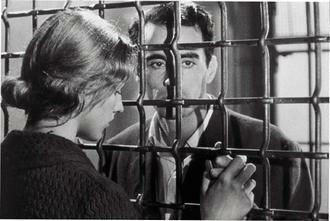 What Bresson understood is that the viewer will do this automatically. There is no work involved. As human beings, we immediately “fill in the blanks” with our own experience and beliefs. And in this case, it transcends what more demonstrative acting might have brought to the screen. At times, the film seemed to be edging towards some sort of social commentary. The philosophical discussions hinted at a “message”, but then the film rises above that. His decisions had nothing to do with a belief in a “superman”, not beholden to laws or a normal job. He simply does not know what he wants. Does he love Jeanne? Does he want her? Does he want a job? He is a slave to whim, laziness and addiction. When it seems honorable, he offers her support. When things get tough, he pushes everyone away. He lives moment to moment, spurred on by the excitement of a pick-pocketing “job”, preferably one with a chase. This excitement makes him feel alive, and momentarily distracts from mundane challenges like relationships and employment. Despite Bresson’s insistence that this is not a thriller, it nonetheless has its fair share of tense scenes. From the start, as he picks his first pocket, the air crackles with apprehension. A different kind of suspense permeates the rest of the film. We wonder if he will get caught. But we are involved not so much because he is the “hero”, and we want him to win. Rather, we are curious as to what he would do with himself if he were caught. His entire life, his energy, what gives him spark, is so dependant on spontaneity, that a prison sentence might well amount to a death sentence. This shadow lurks as he evades the police, almost to the degree that we forget that he has not killed anybody, and is not going to be hanged if caught. Brilliantly simple and engaging. I highly recommend it. This entry was posted on January 28, 2010 by Ian Kay. It was filed under Pickpocket (1959) . These movie reviews are so artfully written! Even though I have never seen any of these movies, I feel like I have. It left me wanting more! Thank you for the kind words, Muss Karat!